If store bought pimento cheese gives you the willies, raise your hand. My hand is high in the air. I do not like the taste of that orang-y spread slathered on between two pieces of sandwich bread. Blech. With that fear, I believed I did NOT like pimento cheese. I judged it harshly, by it's fake counterpart. 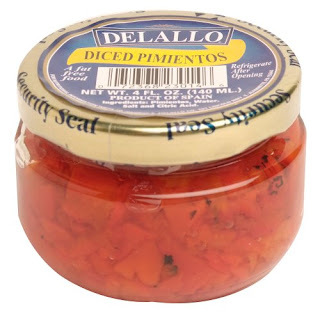 When in reality... Pimento cheese is a very yummy food! I happened upon the realization by accident. It was a church work day, our food supply had dwindled to little. I was racking my brain as to what I could bring to help feed a bunch of hungry workers. I gathered a little of this and a little of that and had nothing of real substance. I remembered that I had a good bit of shredded cheese in the fridge and thought to myself, I'll bet I could make something with that. Mix all ingredients til spreadable. This pimento cheese is not smooth, but it will spread. You will see the bits of cheese, the pimentos, flecks of pepper... It is a very nice mix. I spread some on sandwiches and put some in a bowl with crackers and veggies. I like pimento cheese now. And it's really, really good with BACON! Know what you put in there, it makes a WORLD of difference!